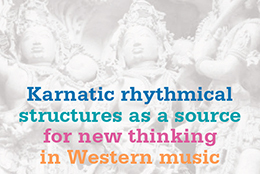 The symposium and concert held around my PhD, 'Karnatic Rhythmical Structures as a Source for New Thinking in Western Music' was a great success. There was a full day of presentations and discussions chaired by Michiel Schuijer (AHK), culminating in a round table, and double evening concert. Find out more and view photos from the day below, or see right for links. Symposium speakers were fellow teachers of the programme 'Contemporary Music through Non-Western Techniques', David de Marez Oyens, and Jos Zwaanenburg; Peter Wiegold (University of Brunel); and special guest Miles Okazaki (New York). B.C. Manjunath (mrindangam) and Dr. Mysore Manjunath (violin) lead a Karnatic seminar. After a concert with pieces written and performed by advanced students of the programme 'Contemporary Music through Non-Western Techniques', Dr. Mysore Manjunath and B.C. Manjunath closed the evening with a concert of Karnatic music.